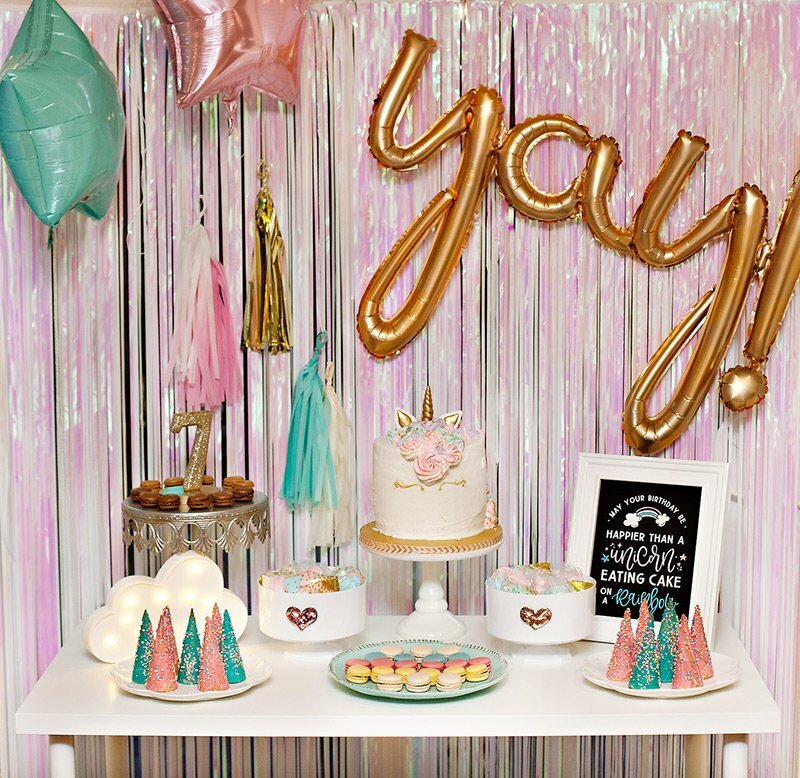 Abby from Style Me Pretty recently created the most adorable Pink Birthday Party for her daughter Audrey’s first birthday! 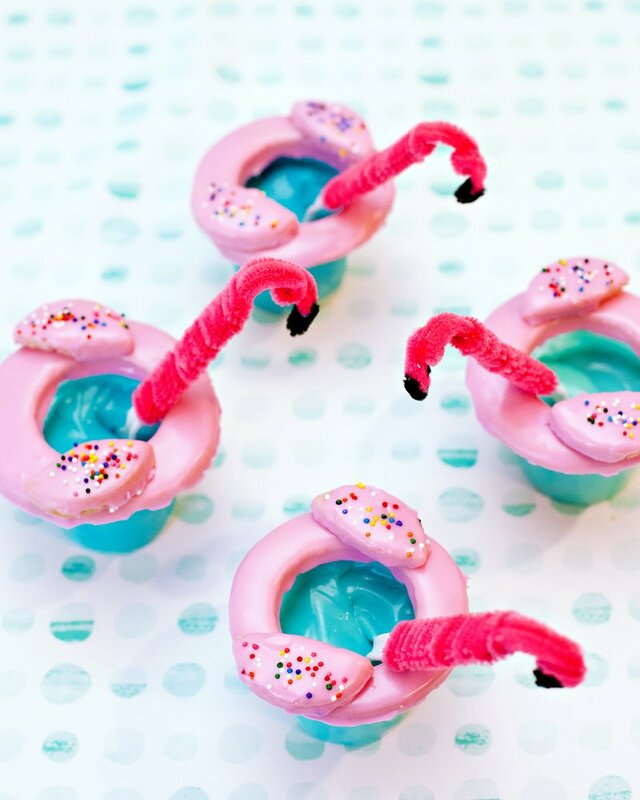 From pink balloons & cupcakes to pink margaritas for the adults, you can check out all the pink-a-licious details over at Cookie magazine. 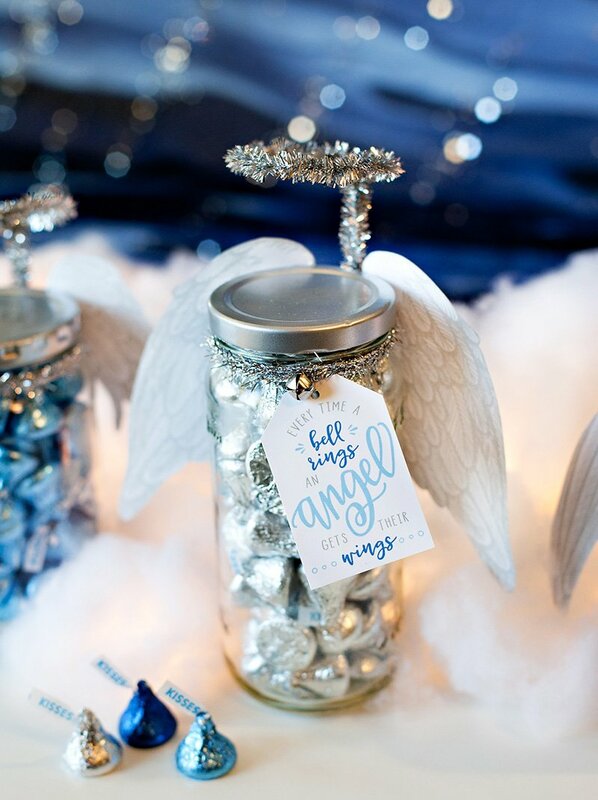 She’s also generously offered to share the DIY tips for these adorable Bubble Tin Favors with us, so read on for all the how-to info, plus a downloadable template for the labels and a few more detail shots from the party! 1. Treat the inside of the cans with craft sealant to help prevent leaking or rusting. 2. 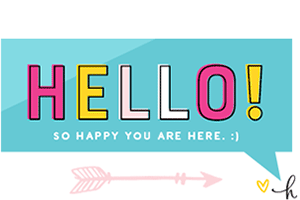 Download and print out the template for the bubble labels and trim just under and above the pink lines (so that the lines show) and horizontally at the end of the pink lines. 3. Adhere to the tins using as light of a tough as possible so you don’t leave fingerprints. 4. To create the pipe cleaner wands, shape the top of the wand into a circle, then twist the end around the handle. 5. Measure your raffia to about 18.” Holding the pipe cleaner in place, wrap the raffia around the wand and the tin, tying in a bow at the front. 6. Fill the tins about 3/4 full with the bubble solution (can be found at party stores). 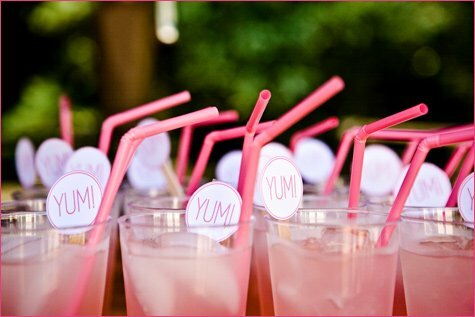 A few more party details are pictured below… I just love the look of these pink drinks with the “YUM!” drink stirrers & pretty straws! Thanks again to Abby for sharing these lovely details with us! What a beautiful party. 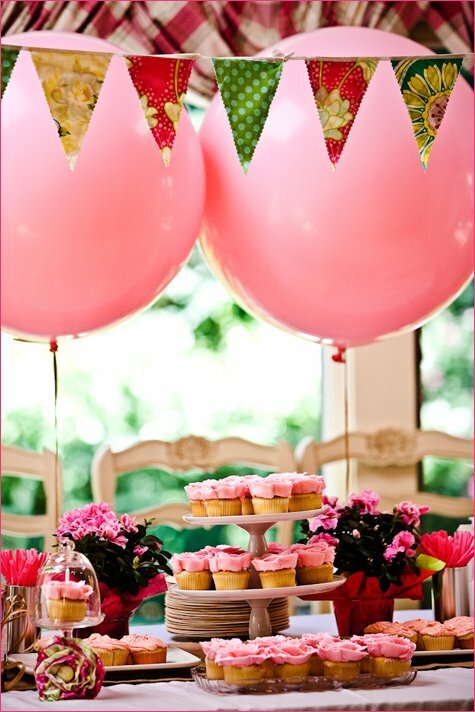 We are doing a balloon theme later this year and I LOVED seeing the picture of the large pink balloons. Well done. I just loved all the details…..Congrats! Loved the bubbles….thanks for sharing…..I am going to use it for my wedding!!! This idea is really nice.. I love it!! I love the petal cupcakes. The pipecleaner bubble wands are unique, too. Great ideas! Beautiful! 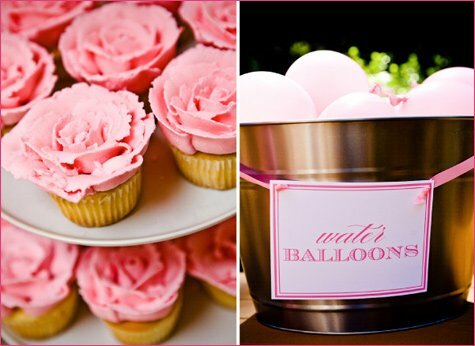 I love the pink rose cupcakes. How cute are those bubble tins? And the cupcakes are gorgeous! Oh *this* is *lovely*!! Oooh, I so heart pink, and this is truly delightful. Where can I find that cute little cupcake dome tray? absolutely adored the bubble tins and wands! gorgeously creative idea! The cupcakes are gorgeous! Always looking for new decor for my cupcakes, I hope to use this one & tell everyone where I saw it first! 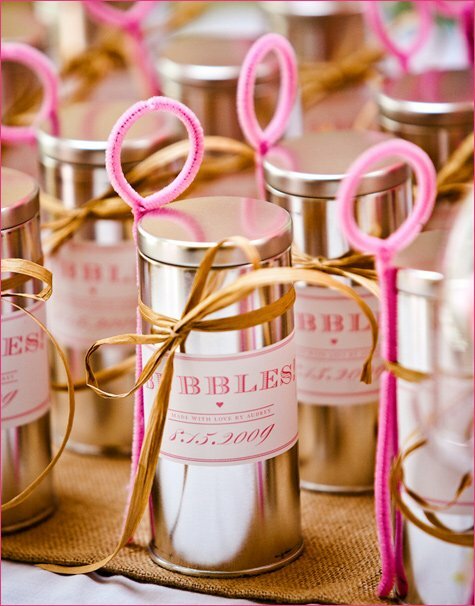 Those cupcakes are precious, and I love the bubble tins—those might be a cool wedding favor?? Oh my goodness – does it get any sweeter! 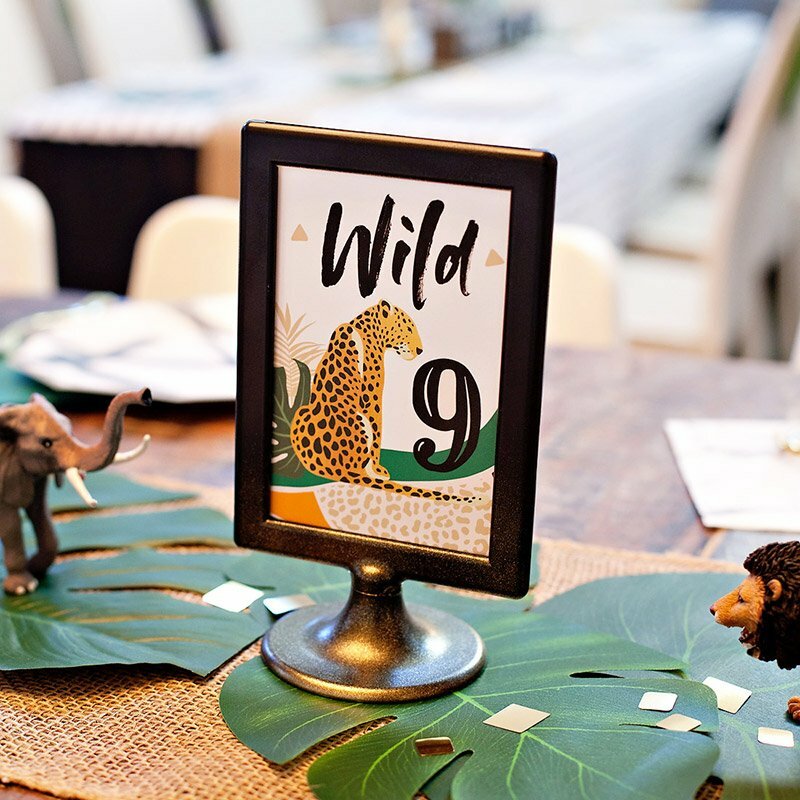 I wouldn’t change a thing; this is a wonderful party design/layout etc.! Love! this is a cute “pink” party!! i’m curious to know what the water balloons were for? I really wanted to have a balloon toss but my seven year old nephew couldn’t contain his excitement and wanted to just throw them. So, I told the kids to have at it. They basically just threw them up in the air to watch them splatter…they loved every minute of it! I love the water balloons. I love your site! Darling! What great details…it is killing me…what is in the white goodie bags? Love this!! It’s my favourite so far! These are great ideas! The cupcakes are gorgeous! What a cute party! Honestly, I would love to have had that for myself :). 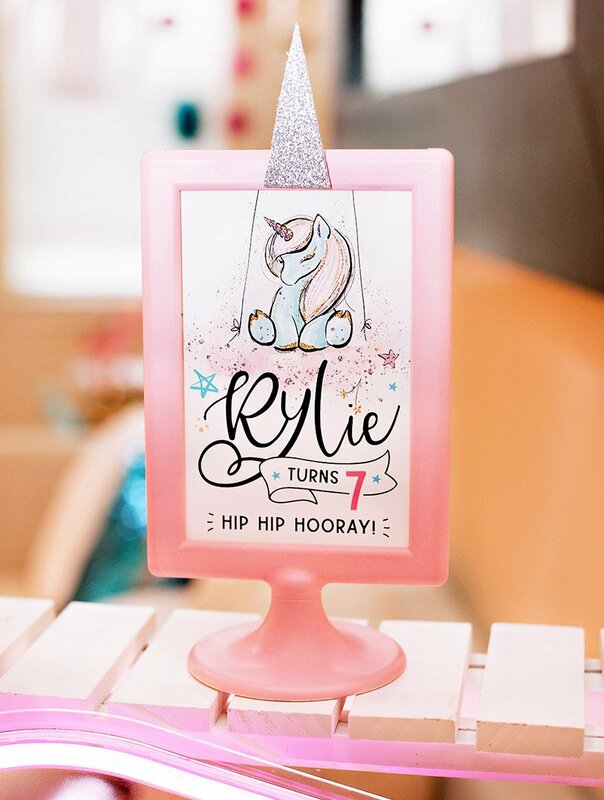 So many adorable details :) I would never have thought of making my own bubbles – fun idea. 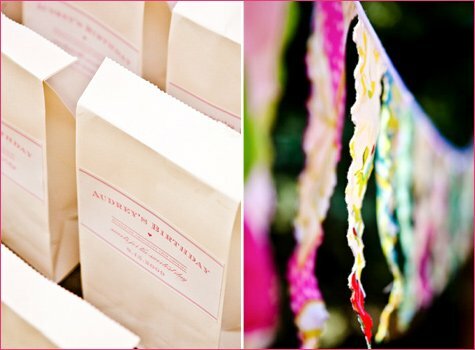 What a stunning party, I jsut love all these little details, the rose fairy cakes and the bubbles so sweet ! Oh… love it! Great pics! I really like how the buttercream was piped to look like roses on the cupcakes – nice touch! That looks like an awesome birthday party, with fabulous details. I love the water balloons and the beautiful cupcakes! What did you put on table – tablecloth or runner? And how did you print sign for water balloons and drink stirrers? Pipe cleaner wands…brilliant!! Thank you for sharing. I love the homemade bubbles. They would be great for wedding favours. So much more unique than the typical small plastic bottle. The labels could be made with pictures of the bride and groom. Do the pipe cleaners really work for the bubbles? I tried it and I can’t seem to form the bubbles in the wand–solution just sticks to chenelle? Yes – the balloons are 36″. Nona – I’m not sure about the pipe cleaners since I haven’t tried it myself, but I’ll ask Abby about it for you. stay tuned! I am making these favors for my daughters bday but I am worried because the pipes don’t work, no bubbles are coming out. Am I doing something wrong?? Did anyone have this problem?? I am going to try and be a copycat! My question is, what was in the goodie bags??? AND, what other recommendations might you have on how to pull this off?? Hi! Could i know how did u make pink drink? …. they look amazing !!! What a great party! I am planning my granddaughter’s first birthday and wondering where the swizzlers came from. Did you make them or can you tell me where I could order? Thank you for sharing your wonderful ideas. Where did the pink YUM! sticks come from? Thank you for sharing, my little one turns one this september and I plan on using some of your great ideas!! Just beautiful……would you be able to share what time of day you had your party and what else you served your guests as way of food? I can’t get the story from Cookie anymore, as it’s been awhile…..thank you! Adorable! Love the drinks, cupcakes, and bubbles! *sigh* Ladies, I have something to say about the tins. I followed the instructions, bought the same tins and made my own bubble solution – BTW the pipe cleaners worked perfectly when you use a strong homemade solution (I chose one from the internet and got big bubbles, a lot of fun!). DO NOT BUY TINS FROM SPECIALTY BOTTLES for this purpose!!!! 75% of the tins are leaking and rusting 3 days after putting the bubble solution in! My client had me recreate these for her wedding and it is an expensive disaster if you use these tins. The company is NOT working with me on expediting new tins. They won’t be here in time. The party turned out awesome! If I can ask a question, the “tin cans” that you used for the bubbles, I went on the website and can not find them. Can You help me??? Thanks so much! Thank you SO much for replying back to me! I SO appreciate your time responding to me! Thanks again! I love this and I plan to make them for my daughters birthday. I tried downloading the label template and it opens as an Adobe read only file and I can’t customize it. Is there any way I could get the template so that I can customize it with our party info? I do have photoshop. If you need my info so you can make it and then send me the read only file, I’m totally cool with that. I understand the need to keep your own creations in-house. Thanks for your help! Since Style Me Pretty originally created these labels, we only have access to the PDF file that you downloaded and not the original native file. However, you should be able to open pdfs in photoshop and type over certain elements in new layers, so you might try customizing them that way. Sorry I can’t be of more help! Hello ladies, has anyone tried the bubbles in a tin using the sealant idea yet? I would like to see if anyone succeeded before buying the tins. Thanks!! Hi! May I ask where you got the tin cans for the bubbles that’s displayed in the picture? I ordered the tin cans from the Specialty bottle link that you provided. I was aware they were 6 inches but when they arrived, the cans were much bigger than I expected for what was shown in the pictures.